The new Xperia XZ2 (see full specs here) is the latest and most refined Sony phone out there: it features a 2:1 screen, an elegant design with a glass back and an all new Snapdragon 845 system chip inside. It's a true flagship phone with a flagship price, so you might be wondering how it compares to one of the most talked about premium Android phones out there, the Google Pixel 2 XL (see full specs here). The Pixel 2 XL is obviously made by Google and it represents the company's vision of what a high-end phone looks like. So we took upon the opportunity to compare the two right here at Mobile World Congress 2018, looking closer at the design, features and specifications of the two phones. 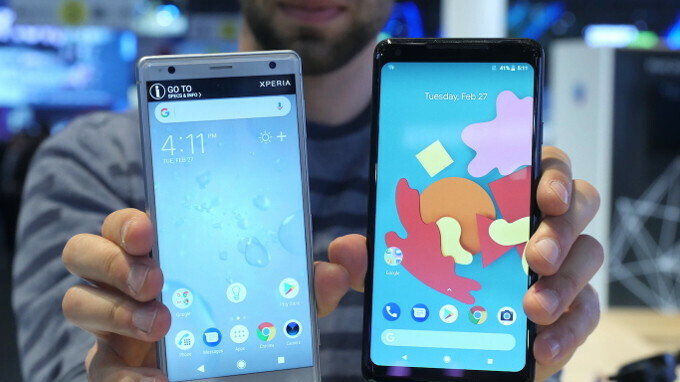 The Xperia XZ2 is a step in a new direction for Sony that for years has been making look-alike phones. The XZ2 is different. It has a curved glass back and it looks elegant and refined. Gone are the rough, square edges of previous Sony phones. In comparison, the Pixel 2 XL looks and feels like the bigger and bulkier phone, and the coated metal back on the Pixel does not look nearly as nice as the glass on the Sony. One feature both phones are missing is the good old headphone jack: instead, you get audio either via USB-C (there is a pair of basic earbuds included in the box with each phone), or a dongle, or you can use wireless headphones. The screen on the XZ2 is a 2:1 LCD display with a resolution of 1080 x 2160 pixels (Full HD+), while the Pixel has an OLED display with a higher resolution of 1440 x 2880 (Quad HD+). What these specs don't tell, though, is that the colors on the Pixel fade to blue when you tilt the phone just slightly and overall the screen appears dim and lacking vibrancy. The XZ2 might be an LCD screen, but it looks a bit more refined and it won't suffer from burn-in issues in the long term. What's more the XZ2 display also supports displaying HDR videos for wider color reproduction. Can the XZ2 match the excellent Pixel 2 XL camera? The Pixel 2 XL has one of the best cameras ever put on a phone, so can the Xperia XZ2 match it? It's still too early to tell, but we took a few test photos with both phones' cameras on the showroom floor at MWC, and initial impressions are definitely in favor of the Pixel 2 XL. Again, these are first tests that are not conclusive in any way, but they show that the XZ2 does not quite have the same great dynamic range and sharpness. We should also mention that while the XZ2 does not have a dual rear camera or portrait mode, it supports the cool 960fps super slow motion video recording and it can also go to very high ISO levels to shoot in nearly pitch dark conditions. The XZ2 is also the first phone to record HDR video in 4K and Sony showed some cool demos with the expanded range that looked very impressive. Unfortunately, we could not test this yet, but stay tuned for our full review where we will cover the video recording on the XZ2. Good news is that both phones have a very clean interface and a performance that feels smooth and zippy. We did not notice any stutter or lag, an issue that still persists with some other Android phones. The XZ2 being the newer phone, also features the latest Snapdragon 845 system chip which brings a substantial double-digit growth in theoretical benchmark performance. The Pixel 2 XL has the Snapdragon 835 chip inside, which is still plenty fast. Both are made using the 10nm manufacturing process, so they have similar battery efficiency. Speaking of batteries, the XZ2 comes with a 3,180mAh cell, while the Pixel 2 XL has a 3,520mAh battery inside. We will test the phones once we get to spend more time with it, but now it's too early to speak about battery life numbers. The Sony also supports wireless charging, a neat perk that the Pixel lacks. All in all, the XZ2 has turned out to be a surprisingly well-built and likable top tier phone. We say surprising because for years Sony has been making the same thing over and over again, and having this change breathes fresh new energy in its phone offerings. The Pixel 2 XL is just a bit smoother and seems to have the edge in camera performance, but it's nowhere near as elegant and does not have some cool new features that the Sony has. So... which one do you like more? Can you pick a favorite? The photo of the toy against iphone X looks better than this sample against pixel 2. You need to see a doctor, buddy! Pixel 2 XL is still the king of photography. They seem in love with even L2.